MLGT series rice huller, as a kind of industrial grain processing machine, is mainly used for hulling paddy and separating rice husk. The rice huller realizes the hulling purpose through the press and twist force between a pair of rubber rollers. Mechanical control system among counter weight and lever maintains a constant pressure between rubber rollers, which ensures a uniform husking ratio. Besides, the gearbox is adopted for speed controller, greatly improving technological effects, lowering consumption and obtaining more economic benefits. 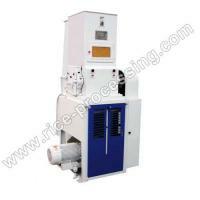 1.High hulling rate, low broken rice content,perfect separation performance, stable operation, minimized noise. 2.Compact and fully sealed structure avoids the leakage of rice. 3.Rubber rollers are convenient to assemble and disassemble. 4.Adopt vertical air suction duct, highly separate paddy husks. 5.There is no need to dismantle the roller any more once a new one is installed. 6.Adjustable pressure and good ventilation keep rubber wear resistance. 7.Adopting gearbox controller to greatly realize the exchange of roller turn speed. Our company is specialized exporter, manufacturer and supplier of MLGT Series Rice Huller in 中国.